The negative health effects of the carcinogenic pollution created by the smokestack emissions of container and cruise ships were little known in our neighborhood until 2006 when the presence of the newly built Brooklyn Cruise Ship Terminal, nestled into the waterfront of Red Hook's dense residential community, eventually brought the issue to the fore. This was despite the fact that for decades the equally, if not more, polluting container ships had been idling their extra dirty diesel engines 24 hours a day at the Container Terminal. Not to mention the additional diesel emissions from the machinery, cranes and trucks servicing the port that had been floating through Red Hook and beyond with little awareness in the community of their effects. However, it was the introduction of the Cruise Terminal to the neighborhood that became the catalyst for the broader awareness of these issues, in turn energizing the community to demand measures to mitigate the effects of these harmful emissions. Little, unfortunately, has been done or even proposed to mitigate the pollution emanating from the container terminal and the ships that visit it. Some of the cranes have been converted to electricity (with more in the works, I believe), but there has been little movement on creating an L.A. style clean truck program, let alone (and most importantly) instigating the practice of "cold ironing" - where the container ships can plug into shore power and turn off their polluting engines, as is being done up and down the West Coast. This is despite the expansion of the operations of the container terminal that will result from Phoenix Beverages imminent relocation to the Red Hook piers and the growing awareness of the impact of the port's operations of the health of our most vulnerable residents. There has been, however, a commitment from the cruise lines - Carnival, who operate the ships - and the Port Authority, who owns the site, to build infrastructure and convert ships to allow for such practices at the Cruise Terminal - and the Cruise Terminal only. This is still "in the works" with issues regarding obtaining an economically viable electricity rate from Con Edison still to iron out, but at least it is moving forward and when it's all in place will be a great improvement to the negative impact the Cruise Terminal has brought and is currently bringing to our neighborhood. This is especially important considering Marty Markowitz's statement, in this Brooklyn Courier article by Gary Buiso, about bringing more cruise lines to the Red Hook Terminal through "aggressive outreach". Let's hope these pollution mitigating practices are in place before that happens and that the Borough President makes sure more ships don't bring more carcinogenic pollution to our neighborhood and into the lungs of our kids - you slipped it under our noses last time, Marty. Not again. Which brings me to the other matter regarding the Cruise Terminal, and the subject of Gary Buiso's article, "City Eyes Uses Near Red Hook Terminal". The use of the Cruise Terminal site itself. In the planning and building of the terminal site, attention to its integration with, and benefits to the community, its general aesthetics and the planning for possible creative uses of the areas surrounding and within the terminal building itself were sorely missing. The NYC Economic Development Corporation had not only neglected to incorporate the previously mentioned pollution abating measures, they had not created anything that "gave back" to the neighborhood of which it was now a part. The lack of vision shown in the planning and design of the terminal lead me to do this post comparing the Brooklyn Cruise Terminal and the cruise ship terminal in my old home town of Sydney, Australia. The point was, so much was possible but so much was missing - integration with the neighborhood, public spaces, waterfront access, park benches, cafes, potential for other uses within the terminal - events, conventions, etc., benefit to the local small businesses - all missing. These shortcomings were regularly made known to the EDC at meetings that were convened regarding their other plans for the Red Hook piers - including those regarding the relocation of Phoenix Beverages to Pier 7 and Pier 11 at the Atlantic Basin. The representatives of the EDC seemed quite cognizant of their falling short on the planning of the Cruise Terminal but seemingly open and willing to look for ideas to address those shortcomings. Which brings us to the meeting last night. About 40 or so members of the Red Hook community, including residents, store owners, representatives from community groups - Red Hook Civic Association, Red Hook Houses, Red Hook Initiative, Red Hook Economic Development (RED), SWBIDC, NY Water Taxi, PortSide NY, Red Hook's Waterfront Museum and Barge, Brooklyn Greenway - and representatives of elected officials, including from Borough President Marty Markowitz, CM Sara Gonzalez, CM Brad Lander, Congress-member Nydia Velazquez, Councilwoman Joan Millman, and a representative from the Mayor's Office were invited to a roundtable discussion, convened by the NYCEDC, to generate ideas for possible uses of an underused bus parking lot on the cruise terminal site. There were definitely some opportunities to take advantage of. The site was available nearly 300 days a year, including 27 weekends. The site was close to the waterfront, with the possibility of tying waterfront activity to it. There would be a storage shed made available and paid parking available in the main part of the Cruise Terminal site. However, there were also certain parameters set that proposals had to take into account - the site would be only used on non-cruise days and would need to revert to a bus parking lot on cruise days, there was no electricity or water, no city funds allocated for programming, and uses would be subject to NYCEDC and Port Authority approval. OK, OK ... yes, it sounds a bit limited, but after the meet and greet and explanation of what the EDC was trying to achieve by reaching out to the community - including the suggestion that by doing this the EDC was trying to make amends for some of the bad blood that had been created during the EDC Maritime section's push for Phoenix Beverages' presence at Pier 11 - the attendees were split into 3 groups where people suggested ideas and each group member was given an opportunity to have input. Afterwards, all of the groups came together to present the ideas their members had come up with. Bike Parking for Greenway / plus amenities - rental, repair, shop etc. ... and I'm sure there were others I missed. One of the points made through all presentations was the need for connection to the waterfront, despite the site not being directly on the water - perhaps through a strong physical connection to PortSide's adjacent location, right on and in the Atlantic Basin, and to new associated activities in the Atlantic Basin itself. Also, the site's location was on the Brooklyn Greenway route, so that needed to be seen as an important element to be integrated into any plan. The fact that the site would have to revert to a bus parking lot on cruise days was also seen as an impediment by most presenters, as any activities would have to be temporary and structures removable. It was asked whether the buses could park elsewhere - perhaps permanently. As a side note, when the EDC first proposed the cruise terminal (perhaps even two) at this location, this bus parking site was to be used for a hotel - so they presumably had enough parking in the rest of the site for their anticipated needs. However, as I discovered last night, the parking at the Cruise Terminal is operated by a private contractor. Perhaps they would not be willing or contractually able to give up some of their parking space for buses - despite the fact the parking lot is never anything like full. Despite that, it was suggested that there could be something permanent on a portion of the site, still allowing for adequate bus parking. This would allow having permanent structures - stalls, perhaps - or a permanent corridor that could connect the neighborhood to the waterfront. It was seen as important to accomplish the "greening" of the site with trees and the like. The aesthetics had to be taken into account. 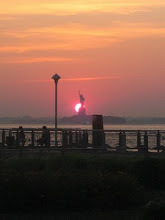 The activities should bring visitors to Red Hook and to its businesses. An important element that had to also be addressed was the transportation options for the site. It was stated that a ferry service was of utmost importance in attracting exciting proposals and the City should make good on its promise, made when it took over Governor's Island, to create a connecting ferry service from Red Hook. Efficient and reliable transportation would be vital to any proposal's success. So, as the roundtable came to an end, it seemed as though there were some creative ideas out there. The point of this process was to come up with ideas to shape and inform the EDC's RFEI (Request for Expressions of Interest)/RFP (Request for Proposals) process in selecting a site programmer that can, as the EDC stated, "best meet the needs of the community". Any or all of these ideas could come to fruition, with different things scheduled on different days - I guess that's up to the programmer. But the attendees were assured that their ideas would advise the RFP process, and the needs of the community would be the utmost priority. It was a much appreciated sentiment. A programmer is said to be picked by Spring 2010, with the first event on the site in the summer. As the attendees started to leave, I also asked if the EDC was considering improving other parts of the Cruise Terminal site. Couldn't there be a better experience created for travelers and non-travelers alike by making the waterfront areas of the terminal site more people friendly - you know, some greenery, grass, trees, park benches - somewhere to sit and watch the waterborne activity on the harbor. There is also a whole corner of the underused main parking lot, on the water at the bottom of Sullivan Street, that could be turned into a green space - isn't that a possibility? After I left the building I took a stroll along the waterfront - catching my first look at the magnificent views from that location - from the Statue of Liberty, across to Governor's Island, the lower Manhattan skyline, all the way up the East River and the triumvirate of bridges with the lights of the Empire State and Chrysler Buildings piercing the sky behind them. I wondered why the Cruise Terminal building didn't have any windows looking out at this view. Even from the VIP room in which we had been having our roundtable there was no acknowledgment of the water that was literally feet away - just behind the almost blank walls within which we were being hosted. I also remembered about "Antiques Roadshow" - something included in the list of "endless possibilities" that BP Marty Markowitz was mentioning for this site in that Brooklyn Courier article - including conventions. Someone told me that "Antiques Roadshow" was considering using the terminal building for an event - but it didn't work out. The building has no loading dock .... and no kitchen. Oh well, let's at least start with the bus parking lot then. Sufficient space for built a multiple parking lots. New York Ship Terminal are the busiest terminals in the America. 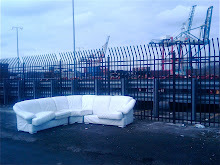 There is a need to build infrastructure and convert ships so to allow for such practices at the "Cruise Terminal". Hope this "in the works" completes soon and people can avail all the benefits. 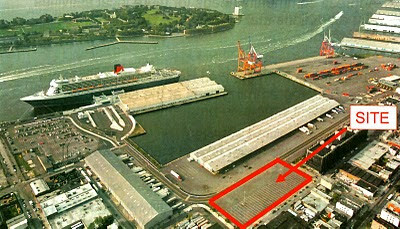 The New York Cruise Terminal is located on 12th Avenue, between 46th and 54th Streets. This is the west side of Manhattan, a few blocks west of Times Square and a few blocks south of Parking Near Manhattan Cruise.